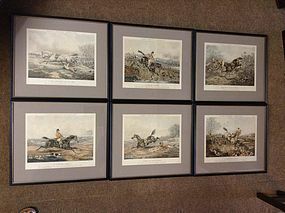 Set of 6 Henry Alken comical, british tongue-in-cheek, fox hunting prints. Quite old. Purchased in England. Original frames, but newly matted. Each measures 14.5" x 16.5". Each titled Plate 1-6 and "Fore's Hunting Casualties". Black wooden frames with slight gold piping.